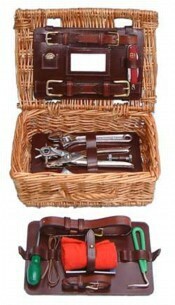 The spares kits below are just some examples of the styles we can make. We will be happy to quote you for your specific requirements. We are often asked what should be contained within a Spares Kit. It is very much a matter of personal preference and depends upon the type of harness and vehicle it will be used with but you must make sure that the harness spares are the correct size (i.e. the trace splice will fit your traces etc.) and suitable for your turnout. 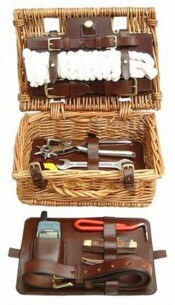 In Private Driving classes your spares kit may be inspected by the Judge. This Spares Kit is for a pony show harness with full collar (hence the spare hame strap) and is contained within a smart, leather case. 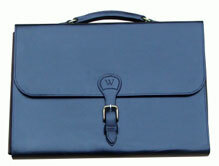 The price is dependent upon contents and the style of case required. This particular model would cost around £ 185.00. We will be pleased to quote for your specific requirements and will need to know your trace, rein and breeching strap widths. The Spares Kit above was designed for a customer to incorporate not only harness spares but also a number of tools for adjusting his carriage. It was a tight fit in a 12" x 9" wicker basket and incorporates a lift out section. The roll on top of the lid holds a halter. There is no candle or matches as the vehicle does not carry lamps. 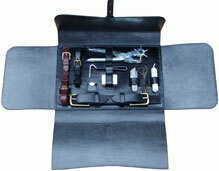 This Spares Kit was also designed for a customer to accommodate both harness spares and vehicle tools. In this example a pocket has been included to hold a mobile 'phone and it has been possible to fit the halter within the basket. Prices start around £ 150 dependent upon contents. There are no candles or matches as the vehicle does not carry lamps.